The example below demonstrates setting up RadCardView to display data from the Northwind database. Drop a RadCardView control on the form. 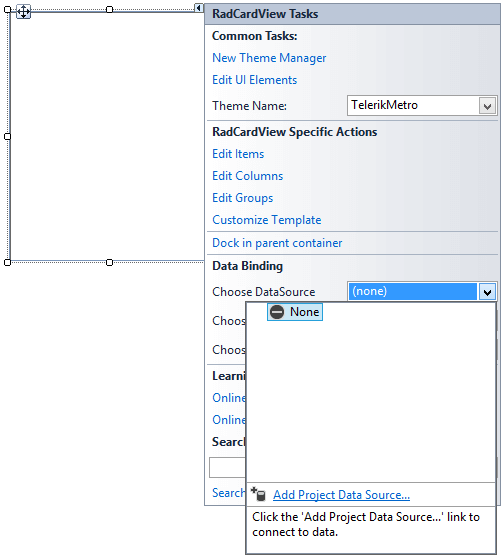 Open the Smart Tag of the control and in the Cooose DataSource drop down select Add Project Data Source.. 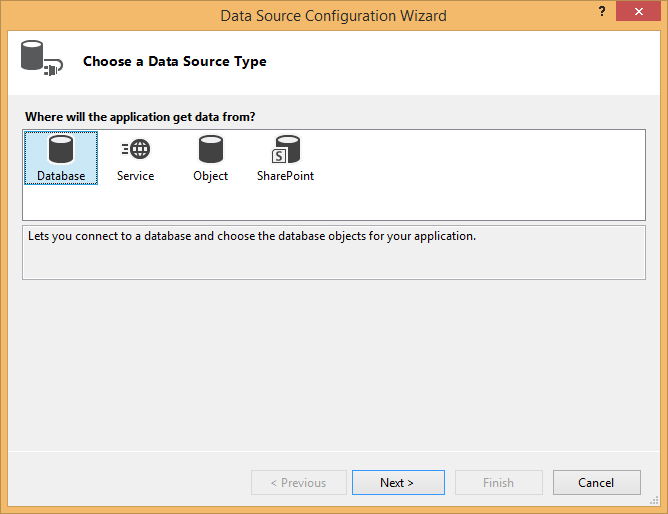 In the Data Source Configuration Wizard, select the Database icon, and click Next. In the Choose a Database Model page of the wizard, select the Dataset icon and click Next. In the Choose Your Data Connection dialog, click on the New Connection button. This will display the Add Connection dialog. In the Change Data Source dialog, select Microsoft Access Data Base File from the data source list. Click OK to close the Change Data Source dialog. In the Add Connection dialog, click on the Browse button. This step will display the Select Microsoft Access Database File dialog. 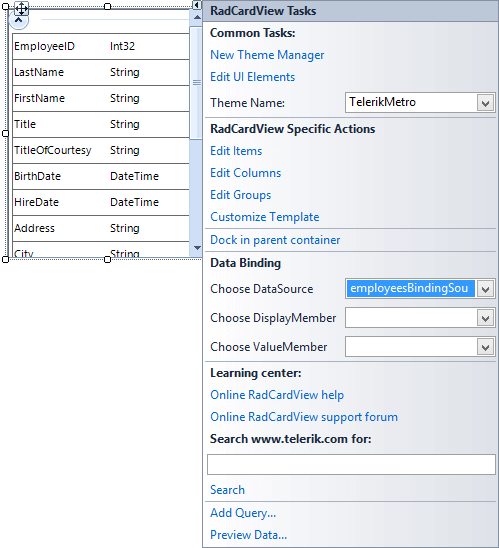 In the Select Microsoft Access Database File dialog, navigate to Telerik UI for WinForms installation directory and locate the Nwind.mdb file within the \Examples\QuickStart\Datasources directory. Select Nwind.mdb and click OK to close the Select Microsoft Access Database File dialog. Click OK to close Add Connection dialog. In Choose Your Data Connection page of the wizard, click Next. This step will display a Microsoft Visual Studio dialog that prompts to ask if you want to copy the file to your project. Click Yes to close the dialog. In Save the Connection String to the Application Configuration File page of the wizard, click the Next button.